I’ve heard the name Thundercat for quite some time, often associated with big name acts and typically working from behind the scenes, but it wasn’t until To Pimp A Butterfly, which he was instrumental in, did I begin to give him more attention. I had no idea what his solo music might sound like but from his name and the 70’s era exploitation album cover for Drunk I envisioned something a la George Clinton. After giving the album a listen, I would have to say that I wasn’t too far off the mark. Drunk has a futuristic sound heavily influenced by jazz and funk with sizable doses of R&B, hip-hop, soul, and much more. It’s really hard to properly classify it’s sound as it’s an amalgamation of free flowing instrumentation, crazy synths, funky bass lines, and random noises. While it comes in at a hefty 23 tracks, each track is really just a bite size offering that fades away almost as quickly as it arrived. There are so many varying sounds on the album but “Jethro”, “Walk On By”, and “A Fan’s Mail (Tron Song Suite II)”, were the ones that really stood out to me. All in all it’s a fun, light listen that whisks you from one soundscape to the next evoking all kinds of vibes and emotions. Thundercat’s whimsical, airy vocals add just the right touch to the already “out there” production. Lyrically he’s all over the place, oftentimes not saying much at all, but there are a few moments of true levity, only to be undercut by a fart noise or cat’s meow. Underlining the whole trippy nature of the album. He’s made a lot of friends in the industry from his work behind the scenes and he made good use of those contacts by enlisting the likes of Michael McDonald, Kendrick Lamar, Pharrell, and Wiz Khalifa. They all bring their own unique charm to the proceedings, but hearing McDonald on “Show You The Way” was nothing short of perfect. Drunk is easily one of the most unique albums I’ve ever heard. Have you heard Drunk? What’d you think about it? Who had your favorite feature? Let me know in the comments below and be sure to leave your rating for the album. Drunk is easily one of the most unique listens I've had in quite some time. 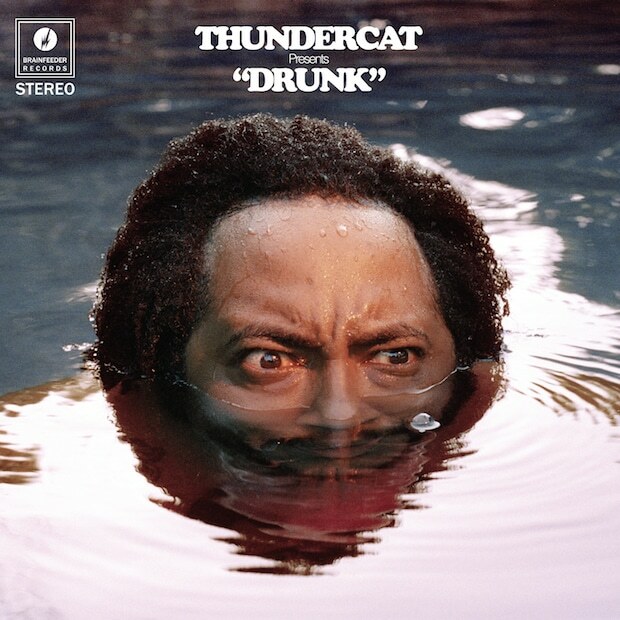 It's crazy brew of free flowing instrumentation, crazy synths, funky bass lines, and random noises give you a peek into the wild mind of Thundercat.